The degree of recommendation of “Field Athletic Yokohama Tsukushino” is 4.0! 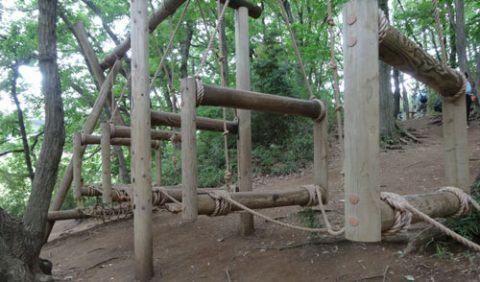 Note: We refer to play equipment and place called “ropes course” in English-speaking countries other than Japan in “athletics” or “field athletics” in Japan. 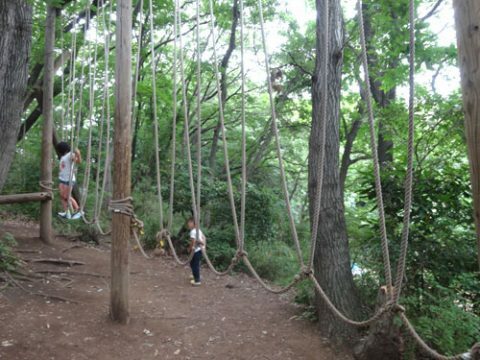 In the meantime In this site, I will write “ropes course” in English as “Athletic” in Japanese flow. Field athletics Yokohama Tsukushino is a field athletic that made use of old-fashioned (?) Forest topography. It is an athletic which clears the athletics made by logs and ropes one by one. 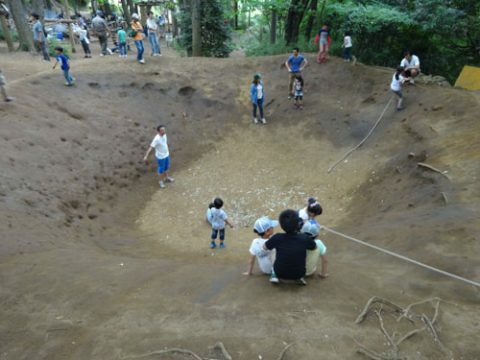 Adults can enjoy it together, but basically it is a place where children play. Athletic is divided into 4 stages, there are 50 athletics in total, it takes about 2 hours to 3 hours to clear the whole thing. It was Saturday when we went. There was a row of people in difficult “high elements”. But I think that the line was flowing relatively smoothly. It was about two and a half hours. 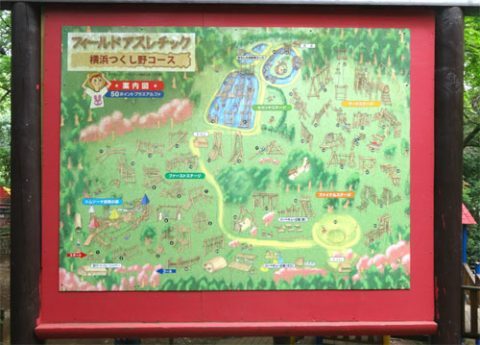 In addition to 50 athletics, there was also an area called “Tom Soya adventure forest”. 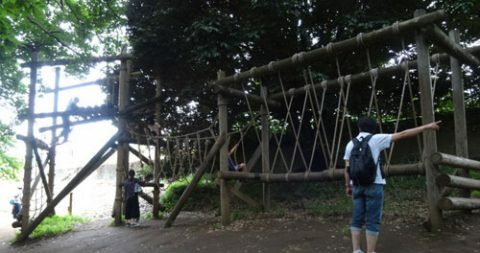 “Tom Soya adventure forest” alone was not enough to play in an hour. 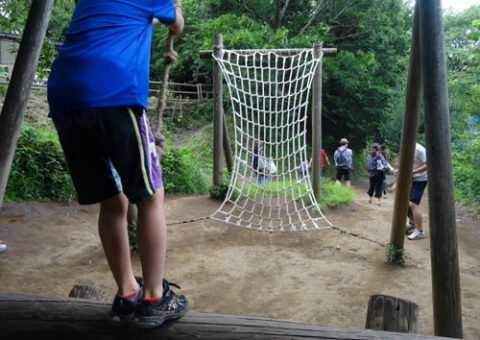 Go from the morning, play with athletics, barbecue and play in the forest of Tom Sawyer adventure. . . 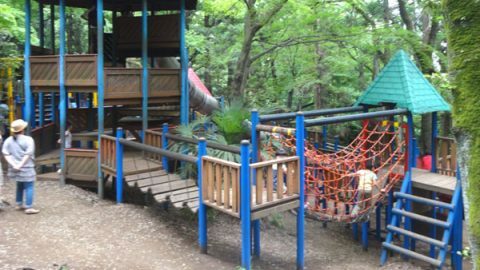 It is a place where you can play all day. Besides, the charge is 2,100 yen (2 adults, 1 child) in one day. 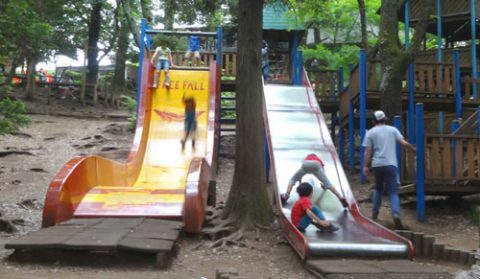 It is also a gentle to your parent’s wallet, and the fulfilling feeling of the child is also satisfied, and it is a facility that you can recommend. 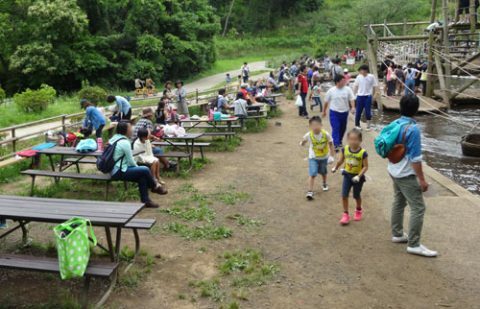 The barbecue is an extra fee, and reservation is necessary for ingredients 3 days in advance. 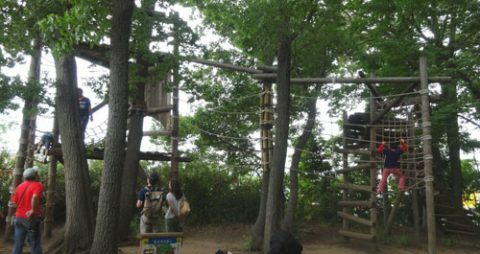 There is a paid facility with a similar play place, named “Forest Adventure”. But the difference in cost performance is clear from that. 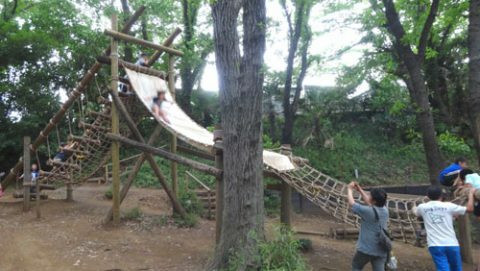 However, Forest Adventure has been carefully considered for safety, and extreme caution has been paid so that no accident should happen. 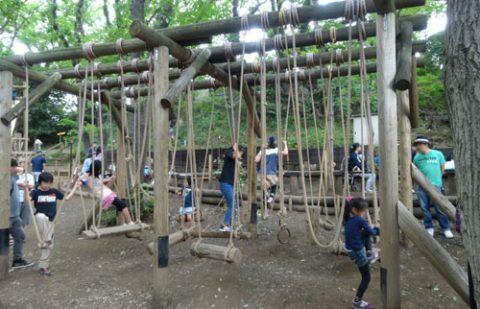 However, “Field athletic Yokohama Tsukushino” is an old facility that only provides playthings, so even if you fall out of the playing equipment it is self-responsibility. First of all, I will explain the location of Field Athletic Yokohama Tsukushino. From Shibuya take the Den – en – toshi line and arrive at Nagtatsuda station in about 30 minutes. 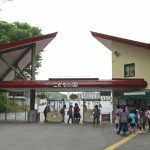 It is about 1.5 Km south from Nagatsuda station, so you can go by taxi from the Nagtsuda station with a price slightly above the first ride fare. Because we will arrive at less than 1,000 yen, this is the most recommended if you go by public transport. You can easily call a taxi for the time you return. However, it takes time for the time zone when Route 246 (Atsugi Kaido) gets crowded. Nagatsuda station is a transfer station. Therefore, around the station there are book stores and bakeries, as well as restaurants. It is also convenient to go after eating lunch and also after you have bought lunch. 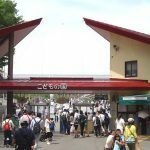 The station closest to that place is Suzukakedai station and Tsukushino station. However, since there is about 1.2 Km, considering the transfer time of train, I think that it is better to use a taxi from Nagatsuda　station. By the way, if you go about 3 Km north of Nagatsuda station , you will find “kodomonokuni”. It says “Please come by public transportation” on the official site, but if you have a car you feel like you’d better go by car. If a child falls into a pond, you may have to change clothes, so it may be clean clothes on the contrary. But basically it will be full of mud because it plays in the mountains, it will also become sweat, so as a parent I feel a bit nervous about getting the child on the train as it is. I thought that it would be convenient if there was a private car if you had to change clothes and take a towel. By the way, because「 Atsugi Kaido 」has a median strip, you can not enter by turning right. Since you need to turn left from the direction heading for Atsugi heading from northeast to southwest, let’s pay attention to the direction. However, the first parking lot with the reception building seems to be full already on Saturdays and Sundays around 11 o’clock. If you are coming from the opposite lane, it might be better to park in places other than the first parking lot in the opposite lane in the first place. However, it is difficult to cross the “Atsugi Kaido” because the footbridge and the pedestrian crossing are also far. 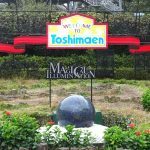 From the experience I actually went there, I will write what I need for my children to have fun. Clothes are essential. All shoes and underwear should be prepared. Anyway, a suite of children’s clothes is essential. I will introduce it later, but the second stage of the field athletic is the “pond” area. It gets quite wet here. Or, it falls into the pond with a good probability. It is seriously falling. I have been looking at the place for a while, but about 20% of children have fallen in the pond. It’s not about getting wet, it’s falling in the pond. From the head! Some children sometimes get involved in nearby children and fall into the pond. . .
My child also sunk into the water to the ankle, the shoes got wet. When including such wetness, it seemed that nearly half of the children were getting wet somewhat. It was still good I went there in June, but if it is a winter season the child will freeze! Even if the child does not fall in the pond, it will hide sweat and become muddy. It seems better to go home after changing clothes. Gloves are also indispensable for children. Children will not have fun as soon as their hands hurt. Gloves are also indispensable for children. So where can I buy the gloves for children? There is a convenience store 「Seven Eleven 」next to Field Athletic Yokohama. There are sold gloves for children, so if you procure here, it is OK! Insect repellent spray can also be procured at a convenience store. Even if I forgot to prepare, I could procure. On the other hand, I brought it but I did not need a leisure seat. While playing athletics, the child does not seem to be taking a break on the leisure seat. Also, there is a table and chairs on the front side of the pond area on the pictures. I can take a break in this neighborhood. Of course, there is a rest area next to the reception building. The introduction was long, but it is the introduction of the actual athletic. The athletics here can do the same thing twice, it is also possible to make one more lap after one lap. 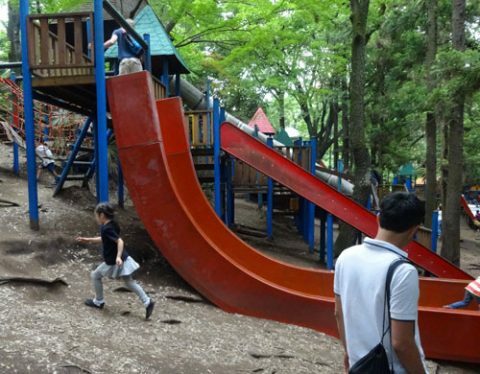 But I think that there are not many children who want to make 2 laps because there are a lot of playground equipment. There is a signboard on each piece of playground equipment, there is a name and explanation. And, if you can, 2 points. If it can not be done, I will add a score at 0 point. But it does not mean that you will get a reward whether the score is high or low. 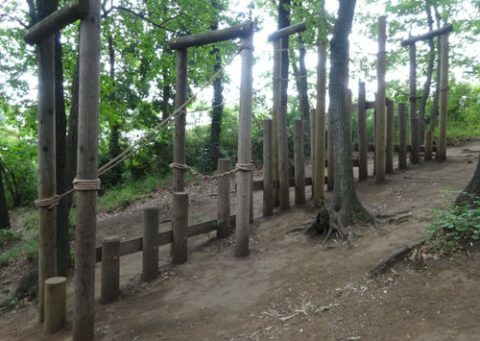 The first playground equipment is “Ecological running”. And the real thing of “Ecological running” is the above. This is the first one so it’s pretty easy. ．．．And it is hard for me to explain everything, so I will only extract things that seem interesting. 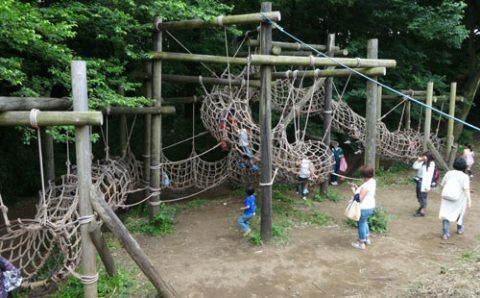 The first area is basic playground equipment, but the fourth “Yamasusonobori” is large in impact, unlike other playground equipment. 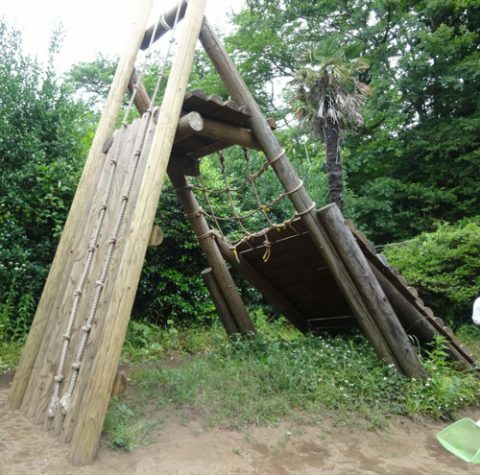 Even adults are worried about whether they can be stopped securely at the end of play equipment. 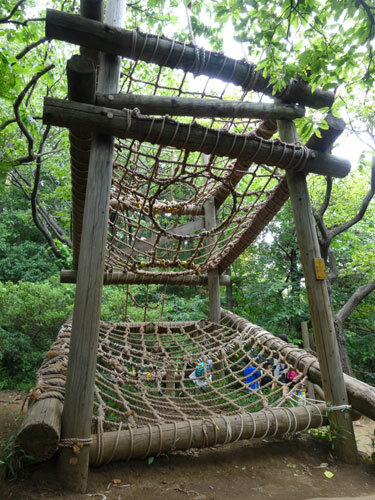 The child goes up from the net of the back and comes down from the round hole from the top and comes down. The child goes up the net in the back and comes down in the foreground. 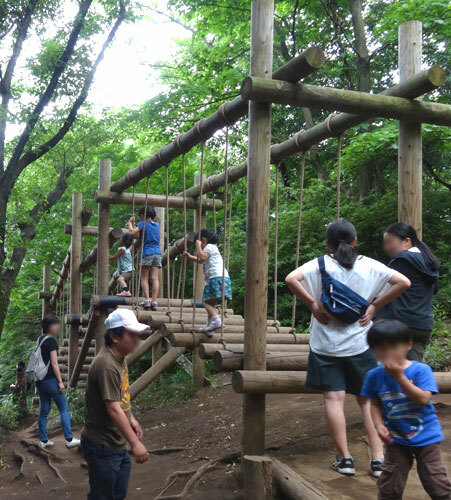 Children did not see this downhill when starting to climb, but some children cried because they could not get off the way. I will introduce the rest space in the area of the pond. 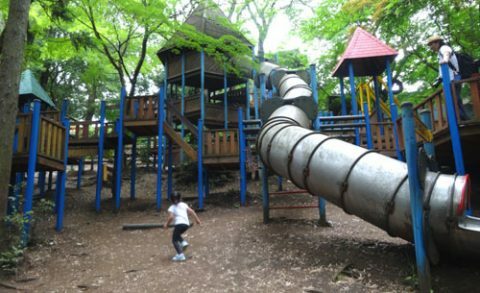 In the vicinity of the pond, there are many playground equipment where children can advance only one by one. Because there are many places where children ‘s rows are made, I think that parents take a break in rest space often in many cases. 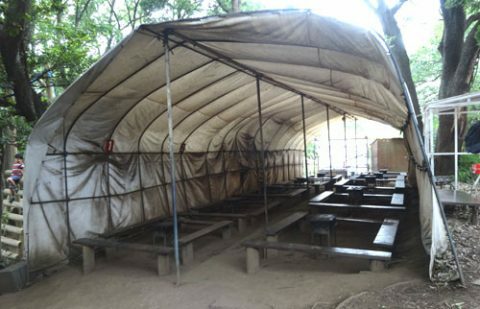 When I went there, it was around 14:30 that I arrived, so I did not see a person eating lunch. 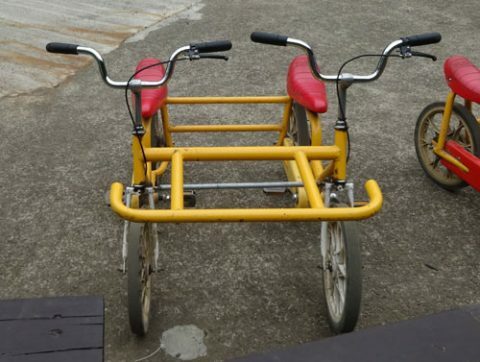 By the way, the area on the left is a two-seater, six-seater bicycle area. Inside this there was a place to ride a bicycle, there was also a shop. It takes about 10 minutes to bicycle the course two times. 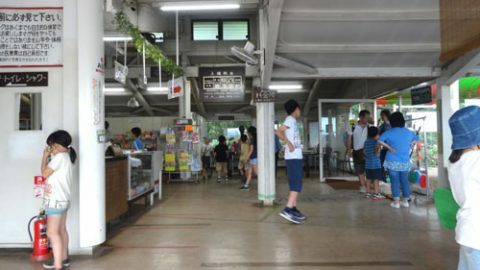 Considering that the entrance fee of this facility is 800 yen (adult) once, the bicycle rental fee of 300 yen per person feels extraordinarily high (laugh). When the raft is away. Please pull the raft with the rope first without impossible. 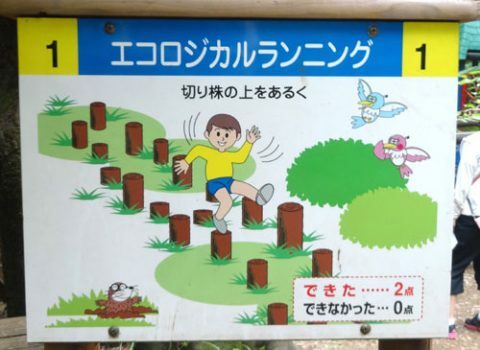 Otherwise the child will fall into the pond. The buoyancy is even smaller than the “raft running” of No. 19. It was difficult for my daughter who weighs 25 kg to stand up. Even if we crawl on all fours, if we get weight on the edge of the raft it will sink from there and get wet. . . . Places where considerable caution is required for children is not it. Children falling in the pond at No.23 “Raft jumping” and this “Raft ride” were in succession. 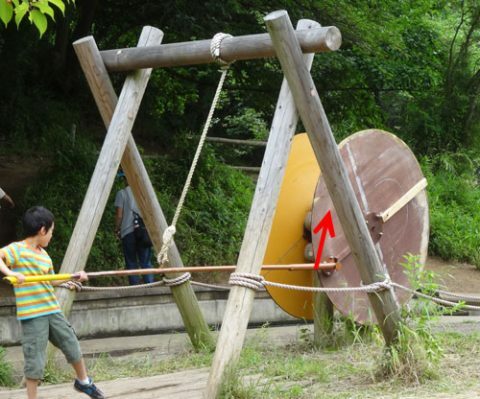 “Boat ride” is for children to grasp the middle ropes and move forward with their own power. But around the middle of this course the rope is considerably loose. 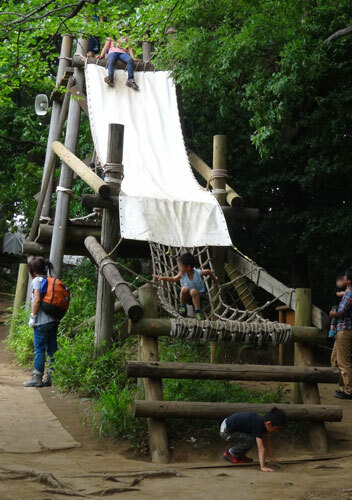 The child will collapse and cling to the rope, but the loose rope can not support the body of the child. 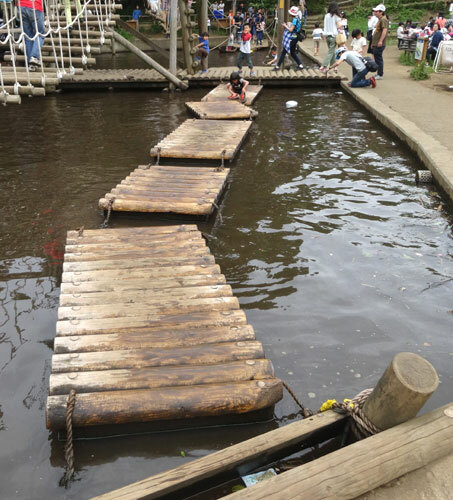 . .
And since both “Raft jumping” and “Raft ride” are very unstable, the probability that children will fall into the pond is high. 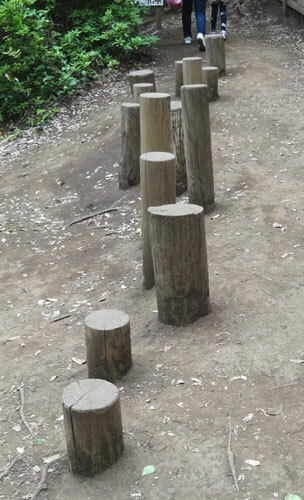 Besides, the bridge in the line where the children lined up is also two logs, so it is also unstable there. 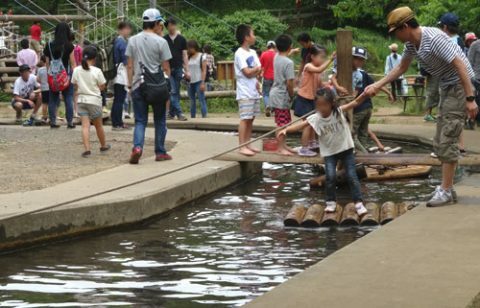 Children who are about to jump out of “Raft jumping” may hit the waiting children or hold hands. Children were just waiting for the order, but some got involved and fell in the pond. Both parents and children have no time to feel relaxed! In this area, really about 20% of children are falling in the pond. Parents should judge carefully if they do not have children’s clothes. If children are not changing, parents can not laugh. Everyone was trying to rotate from the downward direction, but it is easy to turn from the upper direction in the direction with the arrow. This place is not only swaying, we can not go before we can not go through the frame. It is a very difficult place for adults too. 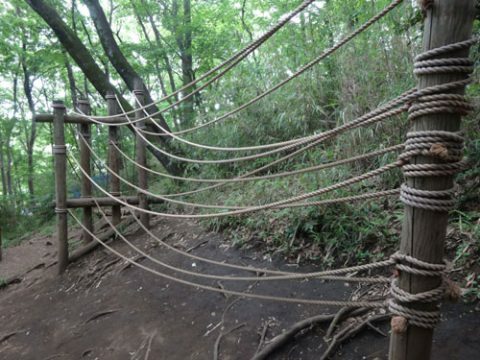 This is a simple thing with only a rope. Many similar things are also many, but harder than it looks. Position relationship between parents and children is like this even at any similar facility. By the way, this is where the first kid is about to cry. Therefore, the children behind the child are in a heavy congestion. High and long. So it was a place where many people give up. 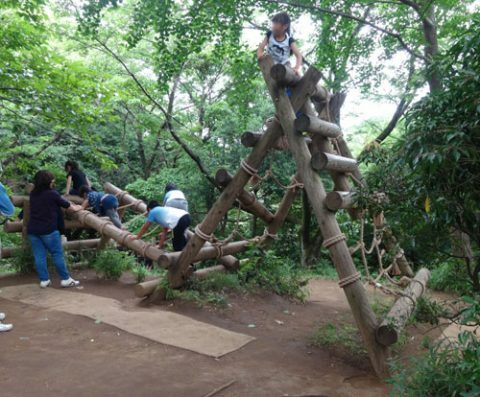 Some of the children climbed, but some children cried because they could not get down. It will enter the final stage from this place. Also, from here around, complex and long playground equipment will increase. After playing a lot this is quite hard. 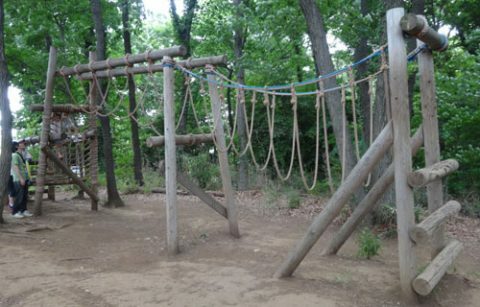 Hold on to the rope, play Tarzan, jump at the end! Some of the children had children who could not leave the rope grabbing from their hands, and some got stuck in the holes of the net. 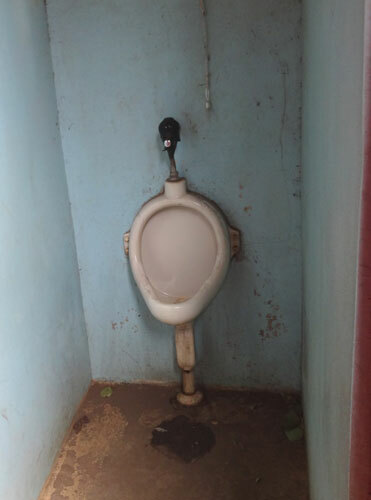 It is a toilet between the first stage and the second stage. There is also a hand washroom on the left side of the toilet. You can play for 2 hours to 3 hours with play equipment . 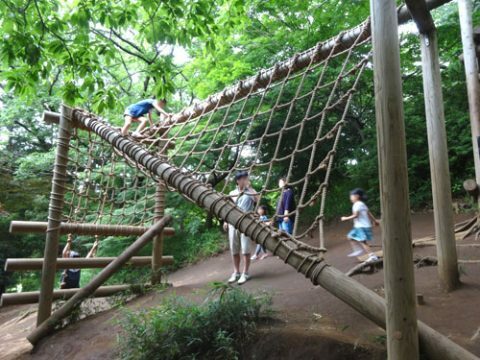 In addition, there is an area called 「Tom Soya adventure forest」 and here we can also play for several hours. 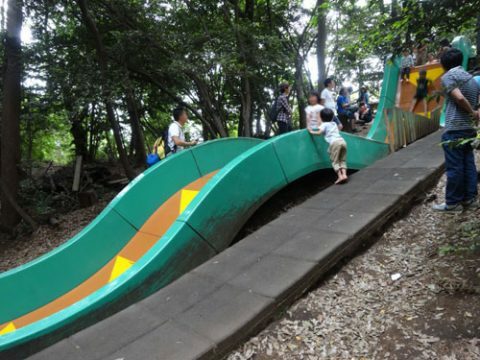 Tom Soya Adventure Forest’s play equipment is characterized by its slide! 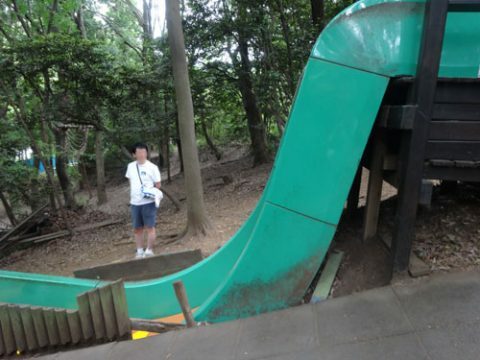 It is a slide named 「two free falls」. Freefall seen from the front. left. “Free Fall” from the side. You will see how steep it is! You will also know its height from the child running in front of it. “Free fall W” located just a little away from “free fall”. The freefall’s slide is two-tiered and its length is twice that of freefall. 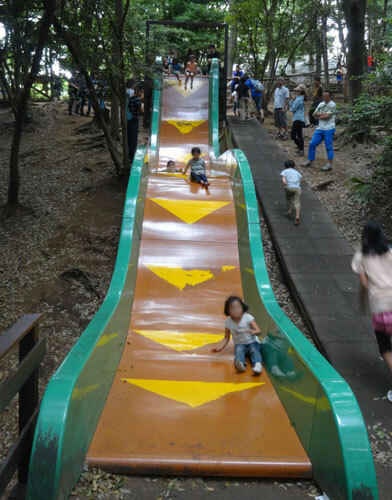 Children can slide twice at once, so popular with children! The first challenge, some children are afraid. But once you slide it is addicting! they　are　sliding over and over again and again! 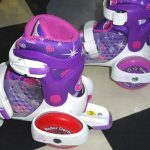 By the way, the shoes become a brake when you are wearing shoes. As bare feet burn yourself, I recommend wearing socks and sliding on the slide! If you do not have socks, it’s good to skate using hemp bags as they are. When you look at free fall W from an angle, it looks like this. From the side of Free Fall W. This height! 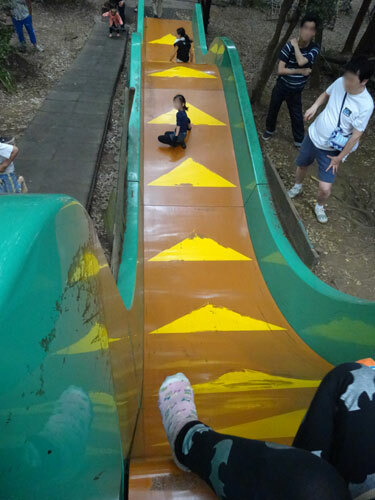 When seeing down from the start position of free fall W. I do not quite understand it even if looking at the picture, but it is quite high for children! 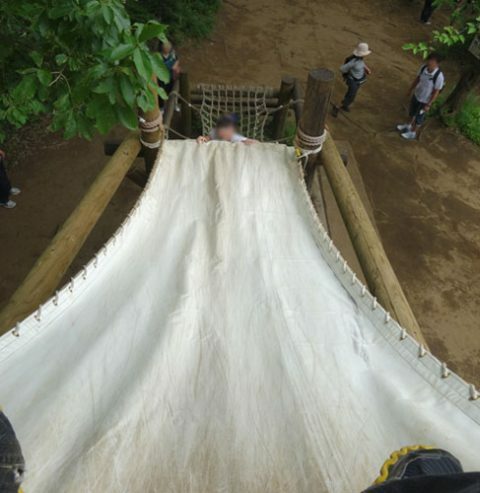 There is another slide in “Tom Soya adventure forest”. It is very popular here too! 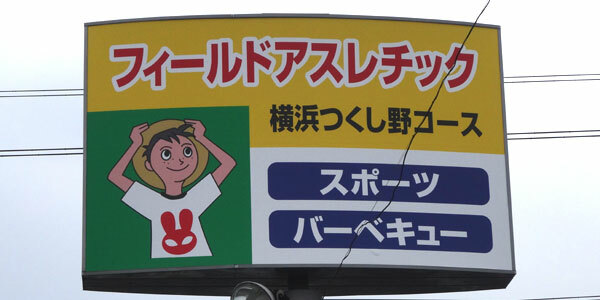 We introduce the building etc of reception of “Field athletic Yokohama Tsukushino” collectively. The building at the reception of Field Athletic Yokohama Tsukushino is like being in one corner of the first parking lot. The middle is the reception desk. As you go down the stairs on the left side, there is a men’s toilet and changing rooms. There is a toilet for women and a changing room at the back of the reception desk. There is a locker on the far right side. After you put your luggage in this locker, go play. It was around 16 o’clock, so it’s already over, but the barbecue place looks like this. 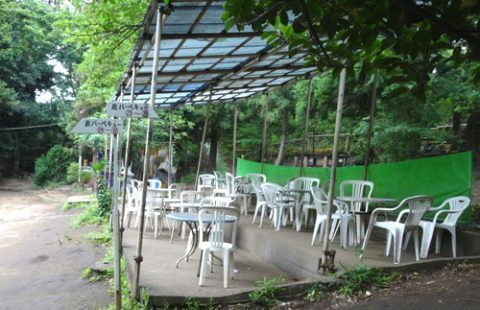 It is a barbecue place with a roof. This is not a barbecue bake place, but there seems to be a table seat with a roof. 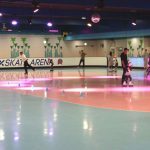 Those over 40 who are 40 years of age are on a 300 yen discount campaign! “Field Athletic Yokohama Tsukushino” is said to be the 40th anniversary in 2016. By saying that, people over the age of 40 are doing a 300 yen discount campaign. If you are over 40 years old let’s have something to prove it! "Heiwa-no-mori Park Field Athletics" is a full-fledged cheap facility. There is also a parking lot. Copyright© Rare beast to our house / Child's growth picture diary , 2016 All Rights Reserved.